No one will know these vegan stuffed shells are dairy-free! Packed with fresh herbs and kale, this stuffed shell recipe is one of our favorite dinners. I swear, no one will know these stuffed shells are vegan. Ok, that was a big statement, let me start over. 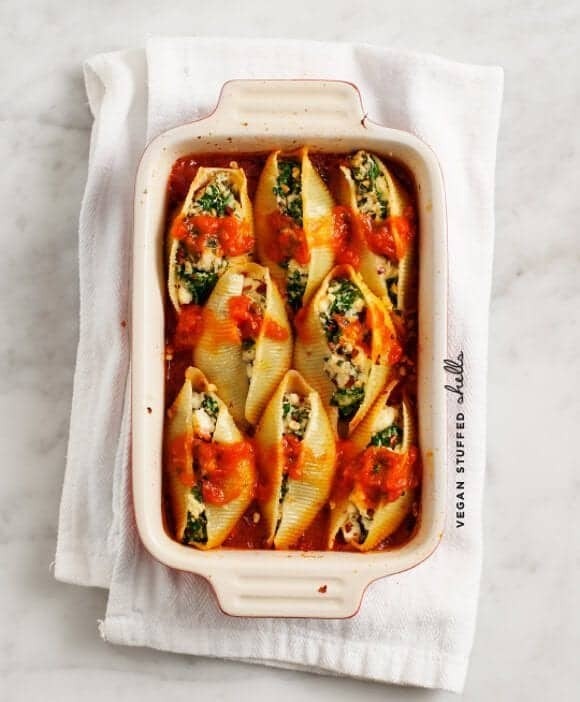 I’m really pretty sure that these vegan stuffed shells will win over your pickiest eaters. This isn’t fancy food here… we all loved jumbo stuffed shells in the 90’s, and I’m bringing them back today with the best quotation marked “ricotta” that I’ve made yet. The trick is to combine cashew cream with tofu. I’ve made a lot of vegan lasagnas by crumbling tofu with herbs – which looks very ricotta-esque, but still tastes decidedly tofu-esque. The cashew cream offers a bigger better flavor, and the tofu is there for texture. I also snuck some kale in for good measure, packing these vegan stuffed shells with veggies. And (now) speaking of fancy food – this vegan stuffed shell recipe was inspired by the selection of ingredients that came in my Hatchery Box. Hatchery is a monthly subscription of tasty artisan-made treats that come right to your door. Much the same way I love my farm delivery for produce – I just love this for the surprise of it all. Surprise ingredients are what get me out of cooking ruts. If you’re not one for surprises, don’t worry: they send recipe cards to go along with each ingredient as well. No one will know these vegan stuffed shells are dairy-free! The "ricotta" is made from crumbled tofu and cashew cream, giving it a delicious texture. Fresh herbs and kale pack color and flavor into this favorite stuffed shell recipe. 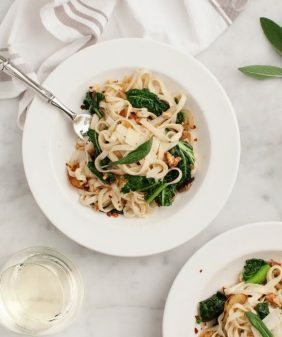 Scoop cashew cream into a large bowl and add the crumbled tofu, oregano, red pepper flakes, kale, chives, and another few pinches of salt & pepper. Stir & taste. Cook your shells in salty water until al dente. Scoop a few tablespoons of filling into each shell, place them into the baking dish. Top each with a generous spoonful of marinara and a drizzle of olive oil. Bake for 25 minutes. Pictured is a half recipe (for 2 of us). I stored ½ the ricotta mixture for the two of us for another night. You can add the chopped kale raw or slightly cooked (heat it in a pan with a drop of oil until it wilts). It'll cook in the oven either way, the only benefit to the extra step of cooking it is that you can pack more in here if it's a bit wilted. One night we added mushrooms - yum. This post is sponsored by Hatchery. All opinions are our own. Thanks for supporting the sponsors that keep us cooking! I need to get on this ‘ricotta’ bandwagon! Cashew cream is one of my favorite things in baked goods, but I need to try it in dinner dishes too! it’s SO good as a cheesy replacement! Easy to do, I boiled the cashews instead of waiting. Fabulous taste. Next time I will increase the receipe by half I guess I tend to stuff too much. But a definite keeper. These look so good. I’ve seen vegan cashew cream recipes but never a ricotta. This former vegan will have to try it some time! 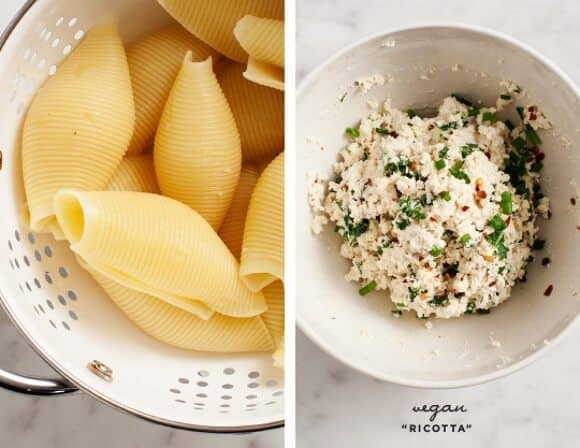 I love this idea for tofu/cashew “ricotta!” Looks delicious! YES! I must get some shells and sauce for dinner tonight! Thank you. what a wonderful recipe for ricotta. LOVE your photos! 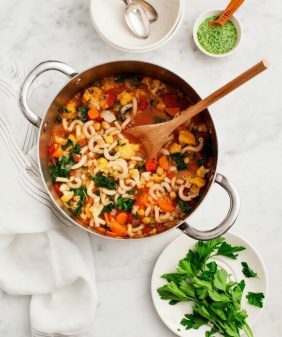 Vegan or not, this looks fabulous! I love the idea of adding the cashew cream! I am trying this recipe immediately. Stuffed shells? Homemade “ricotta”? SO in love. Never tried cashew cream before, sounds dreamy. 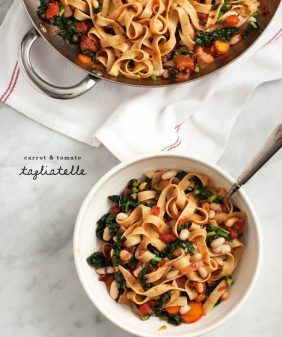 This pasta dish looks amazing! I’ve been seeing so many stuffed shell recipes lately, but I haven’t seen very many vegan ones. This looks amazeballs. You rock. Thank you for filling that void in my life. Definitely one of my favorite dishes!! Hmm.. I am not a huge tofu fan, so I have steered clear of using it as a substitute. I heard there is even tofu cream cheese. I much prefer cashew cream and love how versatile it is! This is a cool use of it Jeanine! I had a question – What kind of pasta did you use? GF or just egg free regular shells? Just regular ones (they have no eggs)… I couldn’t find any that were gluten free, wheat, (or even organic :)). I have another variation coming up tomorrow that’s gluten free & healthier. This looks delicious! I love the healthy and beautiful food on your blog. Your recipes are always so creative. 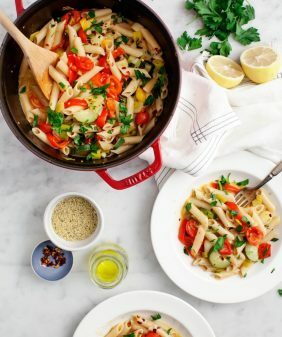 You always have the best pasta recipes, and I’m sure this is nothing short of phenomenal!! Do you think with the tofu, this can be made ahead and frozen too? 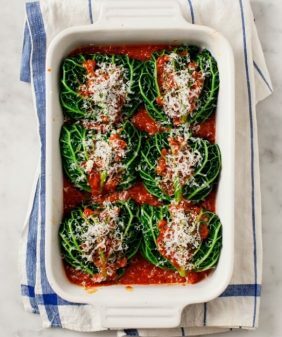 Hi Katie, I think it might freeze well, but I haven’t tried it so I can’t say for sure… I did keep the ricotta filling (separate from the shells) in the fridge for 4-5 days. This is so inventive!!! I have been craving stuffed shells and lasagna lately. This will give me an excuse to try this tofu-cotta out! Alos, I loooove the saucy picture! I can’t wait to try this!! Thank you for sharing!! Hey everybody! Stop saying how good this sounds and just make it already. My wife gave me a standing ovation for this one. She even ate the leftovers for breakfast. She never eats dinner for breakfast. It does not taste or feel vegan, which is to say the filling is savory, rich and rather velvety as opposed to twiggy, dusty and just plain sad. It’s incredibly delicious, guilt-free eating. You can prepare this to oven ready and freeze. To get the creaminess, I mixed the cashew cream with the tofu and finely chopped kale in a stand mixer on medium high speed, added 1/4 cup nutritional yeast as a binder. The key is to beat the political correctness out of the tofu. Thanks Jeanine! Mmmmm. I’ve just come out of a week of eating vegan and I’m definitely trying to eat less animal product. This s=looks like a brilliant recipe for doing so. these looks amazing. Totally going to give them a go. have a great sunday! I don’t think they exist, but check out today’s post – I made an equally delicious version wrapping up this filling and baking it in cabbage leaves. (This filling would also work well in lasagna). oh thank you – I had to laugh about “level of culinary expertise”… you are way too kind. Glad you were inspired by Hatchery, I think it’s such a great concept! Also can’t wait to make this vegan ricotta. It looks great. I am JUST starting to experiment with veganism. Yesterday was day 1 of no meat/dairy but this was so delicious, I didn’t even miss it. Thanks so much for posting this!! It was really incredible!! Can’t wait to make more meals from your blog. Ha, not a bad start for day 1 :). Congrats & I’m so glad you liked it! Made this last night! After so many wannabe cheese vegan dishes my husband was skeptical, but he and I both DEVOURED this. Perfect texture to dupe ricotta without a hint of tofu flavor. I was wondering, is the 1 and a half cups cashew blended then adding half a cup crumbled tofu incorrect? I ended up adding about a cup of crumbled tofu to make the texture resemble ricotta, with just half a cup it was way too runny. Can’t wait to eat the leftovers! Hi Marisa, so glad you both liked it! That’s what I used but it’s possible that my cashew cream could have started out less watery – sounds like you made a perfect fix! Just made these tonight- they were absolutely fantastic! I’ve tried store bought vegan ricotta’s and they were never quite right, but this was incredible. Even my inlaw’s loved them, and they are meat eaters. so glad you liked it, thanks! interesting article like yours. It is lovely worth sufficient for me. content as you did, the internet can be much more useful than ever before. esophageal reflux and bile reflux when I was growing up (past tense). Esophageal cancer being one of the more serious cases that can occur. colon cancer, if it occurs over many years. with the use of orthotics. check these out, because now on the market on skirtini’s and tankini’s which cover more than a bikini but still look great. that cover the ssame topics talked about in this article? six months — this will be the basis of their salary increments. benefit by buying unique clothes, then it needs less mention that the is the thing that can help you realize the dream of buying clothes. I just made this tonight. It was a hit with my husband. He’s Vegan, but I’m not. This is adding faith in me than Vegan can taste better than the average! I made the whole batch of the filling but only used half of it to make about 8 shells. Looking forward to making the rest. yes! So glad you (and he) liked it! I’ve made this dish twice now, and both times it turned out great! The first time I followed the recipe for the “ricotta” mixture to the letter and it tasted great. Last night I only had about 3/4 c. of cashews left so I mixed them with a whole block of semi-firm tofu. The filling still turned out deliciously even with those modifications. Hi Chiara – so glad you’ve liked it – thanks for sharing! LOL! As I was reading about your “Ricotta” I came up with “Rigotcha” you know, since it taste like Ricotta, but you got them because it’s not….LOL! Have a great day! This was really delicious. I served it for my mom’s birthday dinner and it was a hit. I actually made a double batch and froze half. We’re having it for dinner tonight, so that reminded me to come by and say thank you. This recipe is amazing! 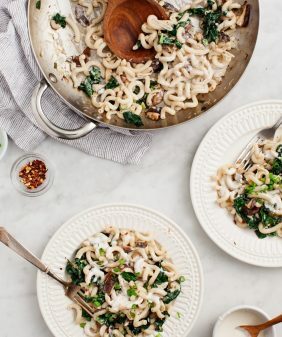 We added chopped mushroom to the ricotta and a few sautéed mushroom on top of everything and it was delicious. We had a non-vegan friend over and served him this and coconut milk chocolate mousse for desert. It could not have been a better introduction to vegan cuisine. Thanks! Made this recipe tonight. New to vegan cooking. Delicious! Used spinach instead of kale and added fresh basil. Also made your vegan French toast.for breakfast. Great recipes. Others have already mentioned this, but it seemed like 1/2 c. of tofu was too small of an amount when combined with the 1 1/2 c. of cashew cream. I used the whole block of tofu with the cashew cream, and adjusted the spices to taste. I felt like the consistency was more ‘ricotta’ like with that adjustment. This recipe is FANTASTIC! The filling is so creamy and flavorful, I am going to be making this again for sure. Thank you! Wow! The “ricotta” was so good on pizza. I added 2 tsp apple cider vinegar and 2 tsp tamari for bit of extra salty-savory punch. To help replace the sweetness in dairy ricotta, I added 1/4 tsp agave. It was heavenly swirled with pesto, atop freshly made tomato sauce and a spelt crust. A keeper for sure-thank you! so glad you liked it! thanks for your suggestions too! Just today my Tween noticed jumbo pasta shells at the grocery store. I used to make stuffed shells often when I was in my early 20’s and learning to cook, but abandoned them as I ate increasingly plant-based. My Tween has never had stuffed shells, so I promised I would research recipes. Yours wins! Can’t wait to go back to the store with Tween in tow, buy that bag of pasta shells, and make him the dinner he can’t wait to try. Thank you! I’ve made this twice now and the whole family (including two teen boys) are fans. Thanks! Thanks for the great recipe! It’s become a regular occurrence in our house. Super flexible too; I didn’t have greens today so I tossed in some lima beans and chopped bell peppers. I add the little leftovers of any veggie. Hi Anna, thank you for coming back to let me know – I’m so thrilled that it’s become a staple! Great recipe! Didn’t have time to make the cashew cream the second time I made it, so I stuffed the shells with orange yam, mushroom and onion. Topped with some pine nuts. Love that your recipes are very adaptable. so happy they were a hit! Looks delicious. Will this recipe freeze?